I missed writing my weekly round up last week so I guess I have a few things to catch you up on before I get into all that's gone on this week. I had my interview last Monday but unfortunately I found out that I wasn't successful despite getting good feedback. I'll admit it knocked me a bit but I'm trying to remain positive and think that it happened that way for a reason, my time for full time employment will come! Between work, kids, home life and all the in-between I've come to the conclusion that I really need more time to just sit. I'm trying my hardest to keep fit and healthy but things are certainly getting on top of late. I've gone back to not sleeping very well and I think that's partly down to the fact that I'm stressing about the job issue. With the kids getting older and bills forever increasing, the need for me to be in full time work rather than part time is more paramount now, a pressure I am feeling constantly. On a positive note though, I was asked for meter readings this week and I've managed to more than half our gas and electric usage over the warmer months which means I won't need to worry so much when we feel the need to start using the heating again. Once less costly bill to contend with! I read a really poignant book this week thanks to Netgalley. 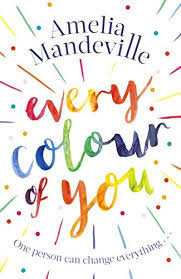 Every Colour of You by Amelia Mandeville is one of those novels that just blew me away, tugged at my heart strings and left me with a sort of reading hangover. It was so unexpected and beautifully written. I'll admit that I cried quite a bit as it neared the end but there's some really important lessons to be learned so I implore people to read this story even when it becomes heartbreakingly sad. Just a trigger warning, there is talk of suicide throughout, nothing too graphic but still worth mentioning before you delve in. We all love a bit of bing watching right? And that's exactly what I did with the second season of Atypical on Netflix. If you haven't watched the first season then you really should rectify that mistake ASAP. It follows the story of a teen living with autism and although it is extremely funny, this is also a programme to get you thinking as it is definitely believable and shows the dynamics of family life doesn't simply revolve around autism and proves just how wrong some people's perceptions about it can be. My favourite thing that I listened to this week was a duet from Justin Timberlake and Shawn Mendes singing my most loved Justin Timberlake song, 'What Goes Around Comes Around'. Even though autumn officially began this week, I still find it that funny time of year when you can never be quite sure of what to wear. The mornings are typically chilly but by lunch time the sun has decided to pop out and everything warms right up. 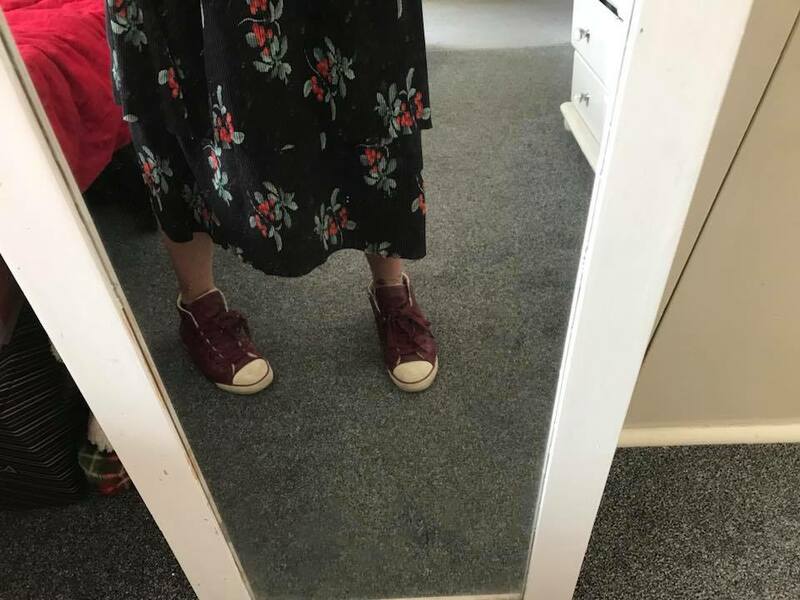 So my new go to combo at the moment is longer skirts and trainers. Add to that a t-shirt or jumper and a denim jacket and your good to go. I actually bought a new skirt in the summer but never got around to wearing it and when clearing out my wardrobe the other day I rediscovered it and finally gave it an airing. Last week I had to make an eye appointment for my six year old. I'd noticed over the past couple of weeks when she was reading that every so often she'd bring the book closer to her face in order to be able to see just what it was that she was reading. Anyway the appointment was this Wednesday just gone and mothers instinct was right, she does need glasses. I've got to take her back next week for them to put drops in her eyes as unfortunately lazy eye/squints run in the family so they want to check for that before giving her the correct prescription. But it's not all doom and gloom because while we were waiting for her eye test, she happened to discover that Specsavers do Star Wars glasses! It's pay day for the husband today and because we've been very good since our weekend away and not eaten out or had any take aways, he's treating us all to a Wagamama (his favourite). Hope everyone has an enjoyable first weekend of autumn. May it be filled be sunshine during the day and cosy nights lit by candle light. Sorry about the job. Things happen for a reason, maybe something even more amazing is waiting for you just around the corner. Love that version of that song! That book sounds like a brilliant read, may have to add that one to my list. Hope you're having a good week.